f you work in an environment which is potentially hazardous, you’ll need to give a little bit of extra thought to what you slip onto your feet. Even if you’re not normally interested in footwear, when it comes to keeping your tootsies safe, you’re going to have to pay attention. Often referred to as PPE (Personal Protective Equipment), work boots shouldn’t be the single factor that keeps you safe. Your environment may be higher risk than something boring (but safe) like an office, but it should still have the protocols in position to keep you free of harm. Wearing proper work boots is a last resort, a safety net to protect your toes, feet and ankles in case other measures fail. If it were simply about protection, you could just encase your feet in the strongest, most protective pair of men’s work boots. Tick. Job done. In reality, there’s more to consider. You need to be wearing these boots all day, every day so they have to be comfortable and practical for you to get around. A pair of boots which are unnecessarily heavy therefore won’t be the best pick. But fear not, we’ve done the research and trawled through the best boot manufacturers around. Below you’ll find the best 23 work boots for men along with answers to some frequently asked questions. What to Consider When Buying a Work Boot? You might need a combination of the above areas of protection to a greater or lesser degree. Midsole protection to prevent the sole being pierced may be a priority for some, while others could be at risk of crush injuries to the metatarsal region, meaning they need a boot that offers greater coverage. While safety is deniably a priority for work boots, the matter of comfort is important too. If you have to stand for long periods in boots which feel like they’re made from concrete, you’re soon going to feel pretty fed-up! Shock-absorbers, particularly in the heel area, can make prolonged periods on your feet far less painful. Taking all of the above into account, there are still more choices to be made… For some employers, appearance is a priority, in addition to comfort and protection. 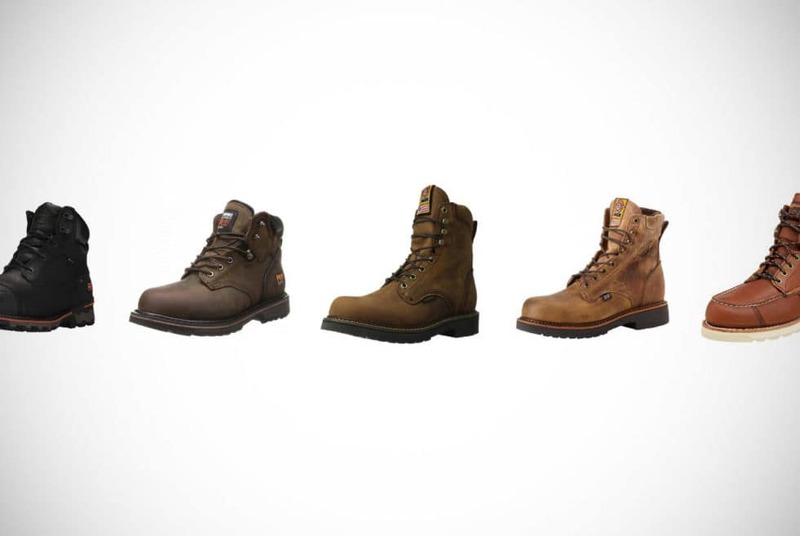 Work boots come in a variety of styles from the functional welly-boot style to the smarter safety sneakers. For some jobs, the appearance is less of a factor but if you’re in any kind of customer-facing role, you might also need to think about how your work boots look too. What are the Best Brands of Men’s Work Boot? If you’d asked this question a few decades back, it would have been a much easier question to answer. In the 1950s there were much fewer companies making high-quality work boots but that’s not the case today. Workers now have the choice of a wide range of manufacturers, all offering work boots with different qualities and at various price points. While it might seem obvious to plump for the most expensive, in some cases the cheaper footwear is just as good as those which cost a lot more. Brands such as Timberland Pro, Carhartt and Red Wing may be more familiar to the general public as they’re all-American names which produce a wide range of goods. 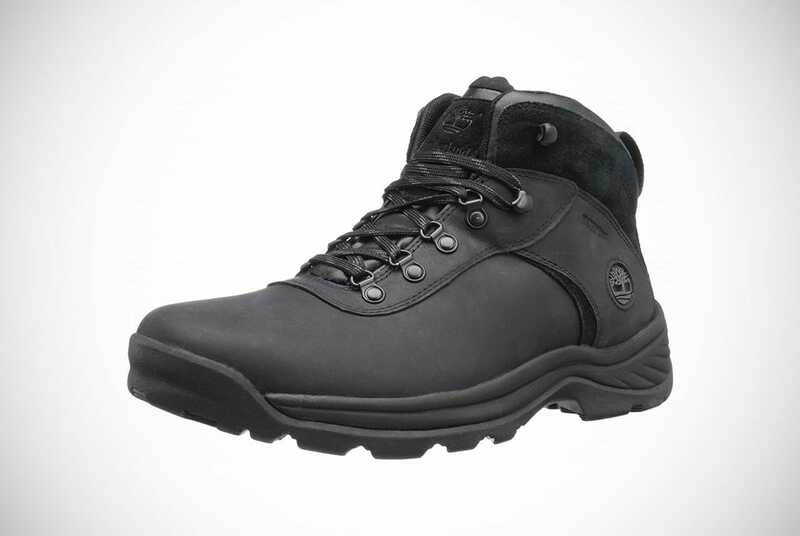 However, there are many other work boot manufacturers which may be less famous, but still offer excellent footwear suitable for the harshest and most demanding environments. These include Justin, Keen and Danner. The question of what brand is best is almost impossible to answer as it really depends on what you need. Some brands offer more protection for the metatarsal area while others specialize in footwear which can be worn when working with electricity. All of the above-mentioned names produce high-quality work boots that you can trust to do the job. The important part is just making sure you pick a model which suits the safety needs of the job. The most comfortable work boots depend on the environment you’re going to be wearing them. If you’re going to be on wet terrain, boots that are cushioned but leak won’t feel very comfortable at all! Look for cushioned padding around the collar. This protects the ankle from being rubbed by the top of the boot and also prevents debris getting in. There’s not much more annoying than grit in the sole of your boot! The length of the boot is a factor for some too; particularly tall boots can inhibit mobility or rub on your legs. It’s all really a matter of personal preference and the shape of your legs. It can be a good idea to read reviews of other buyers to see if any common problems have arisen with the fit. Cushioned insoles are an obvious benefit but look for a breathable membrane on the inside. This will wick away moisture and sweat and prevent your feet from feeling damp. This also helps to prevent them from getting too stinky! The thickness of the sole depends on the purpose of the boot but shock-absorbing qualities will protect your joints. They’ll also prevent your legs from feeling too fatigued after wearing the boots all day long. What are the Main Benefits of Work Boots? If you’re wondering whether there’s any real difference between regular and work boots for men, we’re here to tell you the answer is a resounding yes! In some cases work boots can be worn for casual wear, particularly for pursuits such as hunting and hiking, but there are some key differences which set them apart from an average pair of Timberlands. The toe of the boot is a key area for many workers because of the risk of crush and impact injuries. Working in hazardous environments means that the toes are a particularly vulnerable part of the foot and liable to sustain a much more severe injury. Work boots often incorporate protection for the toe area. Soft toe boots may simply have a double layer of leather but these won’t be suitable for the most hazardous environments. Others have a composite toe; this provides more protection but avoids the use of metal. This makes them lighter and also suitable for use around electricity. The toughest type of boot has a steel toe; this provides the optimum levels of protection for the foot. The sole of the foot is important because if there’s not enough grip, serious accidents may occur. Many working environments have difficult terrains such as uneven ground or slippery surfaces, such as oil. There may also be chemicals or excessive heat, conditions that normal boots can’t cope with. Work boots are specially designed to be able to endure a variety of hazardous conditions, without degrading or falling apart. Work boots all have different qualities so it’s essential to look for a work boot that’s been designed for the specific environment you’ll be in. When you have leather work boots it’s absolutely essential to make sure you clean them regularly. Even if you’re a bit haphazard about cleaning your regular shoes and boots, it’s a different matter entirely for work boots. As well as being an expensive investment you will want to protect, the chances are that the environments you’ll be in will be wet, muddy and dirty. If you don’t take the time to clean this off your boots, the leather will degrade far more quickly. To clean your leather boots, start by using a nylon brush to gently get rid of any surface dirt. Then take a damp cloth and just wipe them clean. Make sure the cloth isn’t too wet otherwise your boots will take a long time to dry. Never use a hairdryer on your leather boots as it can warp the shape permanently. For boots that are heavily stained and soiled you can use saddle soap, or any other type of cleaner specifically designed to clean leather. To make the job easier, try treating your boots with a waterproofing spray before wear and periodically after. The degree of protection you need will depend on the environment that you will be working in. Every industry has its own hazards, but some are greater than others. Health and safety legislation specifies exactly what’s needed for each type of environment and the work boots you wear should be adequate to protect your feet appropriately. Toe protection. The toe area must be able to withstand both resting mass and impact. This may be achieved with steel toes or the use of alternative, lighter materials. Antistatic protection. A static charge of electricity may accumulate within the body, often due to clothing, climate or seating. Boots can help to dispel any charge being held in the body. Electro-static discharge. This goes hand-in-hand with antistatic protection and is required for the explosives and electronics industry. Heat-resistance. To be able to resist high temperatures for a specified period of time. Cold insulation. 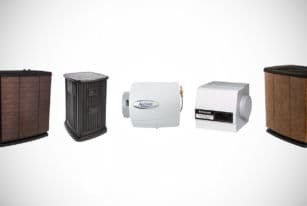 To be able to provide insulation against extreme temperatures for a specified period of time. Midsole penetration protection. To prevent the sole being pierced by sharp objects such as nails. This may be achieved by the use of a steel shank. The above factors are just a guide to the various areas of compliance that may be required for work boots. For specific information, refer to the industry the boots will be used in. Now we’ve covered the basics, let’s crack on with our list of 23 of the best work boots for men! Possibly the best-known brand on our list, Timberland is a name that almost everyone knows. Hailing from New England, their rugged style is loved by the average man on the street as well as celebrities and Hollywood stars. Worn by guys and girls alike, Timberland has become a fashion accessory as well as a legitimate piece of outdoor footwear. Just as comfortable pounding the sidewalks in the city as hiking through wooded trails, Timberland has been around since 1952 and is now a global brand. However, when it comes to work boots Timberland takes the demands very seriously. So much so, that it’s set up a subsidiary specifically designed to meet what every worker needs: Timberland Pro. This operation was first set up in 1998 and dubbed “Work boots for the Professional”. It was as well-received as the rest of its regular footwear and today it’s become one of the most affordable brands of work boot. With features such as steel toes these work boots deliver the performance needed for industry, but still offer a fashion-forward look and a funky style which is unmistakably Timberland. 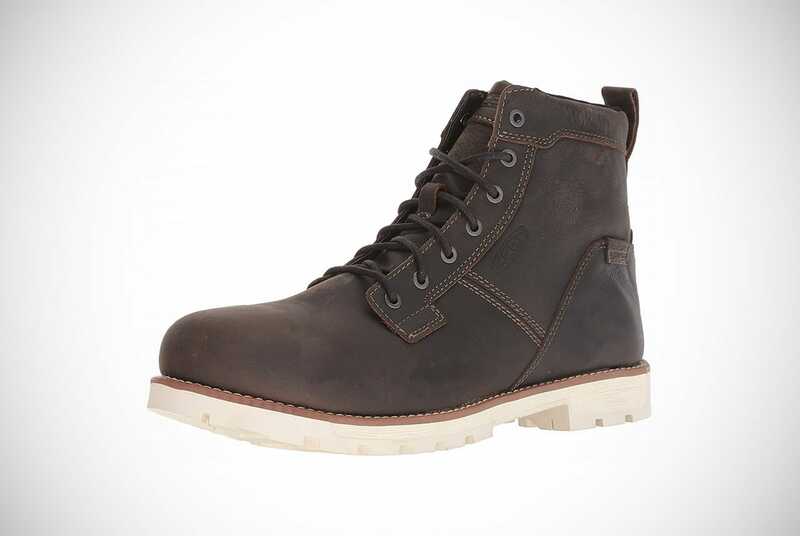 These boots look like a pair of classic Timberlands but they straddle the line between hiking and work boots. On the lighter side of work boots, and the heavier side of outdoor wear, they’re as comfortable as you’d expect but durable too. Made from full-grain leather with a rubber sole, the boots are seam-sealed to provide excellent waterproofing. The D-rings are strong and rustproof so this pair of boots really is ready to tackle even the most damp and wet of conditions. This isn’t the most specialist pair of work boots but they’re a great introduction to tougher and more robust footwear. They’re comfy too, with a padded collar and a cushion which helps to prevent any blistering on the toe. There are lots of other clever little design touches too, such as a fully-gusseted tongue. For those of you not fully up to speed with the details of work footwear, this means that no annoying debris will be able to make its way into the shoe. Lightweight but tough, this is an excellent boot for demanding conditions where there are no special safety requirements. 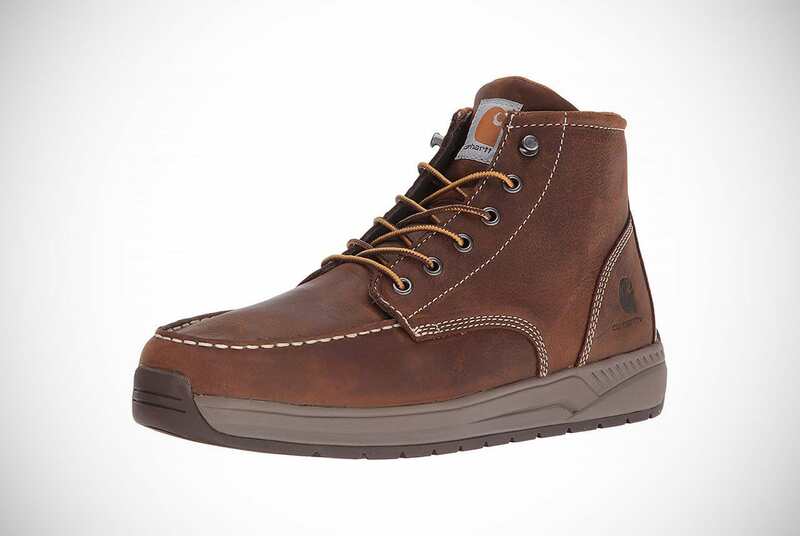 This is the first boot that’s been designed specifically for work, being part of the Timberland Pro collection. They have a distressed look which is appealing, so you’ll never have to deal with that unattractive “new work boots” look. However, it’s not quite so easy to fix the way they feel and you’ll certainly know you’re wearing new boots for a while. They’re stiff and take a while to break down so don’t expect them to mold to the shape of your foot right away. The upper is made from oiled leather; this is what contributes to the distressed appearance and provides a matte look. As well as looking good, this provides a practical benefit as it helps to repel moisture even more. On the inside there’s a waterproof membrane which lines the whole boot. This not only stops water leaking in from outside but also prevents sweat from being absorbed by the leather upper. The soles of the boots are where you’ll see the real difference as they’re both shock and slip-resistant. The asymmetrical tread underneath helps to make sure you’ve got grip, no matter what surface you’re walking on, allowing you to plant your feet with confidence. You can choose between a soft toe and a composite toe design, for those who want extra protection against crush injuries. Timberland avoided a steel toe to prevent conducting electricity. Rigid heel cups provide further protection against any possible ankle injuries while the waxed laces limit chemical damage. The next design from the Pro range at Timberland comes from the Ridgework collection. These are a series of work boots which are designed to offer superior protection, durability and comfort. The uppers are made from leather and the inside has a waterproof membrane lining. This not only enhances the waterproofing from the exterior but protects the uppers from foot sweat. This meets the ASTM F1671-07 standard and repels blood-borne pathogens as well as regular fluids. Anti-fatigue technology helps to make the boots more comfortable to wear, and also absorb shock at key points. This helps to increase the comfort as well as returning some of the kinetic energy. Smart stuff! The safety toe is made from composite rather than steel but meets ASTM F2413-11 I/75 and ASTM F2412-11 safety standards. Electrical protection is also incorporated into this boot, meeting ASTM F2412-11, ASTM F2892-11 and ASTM F2413-11. Technology has been used right across the design of the shoe, from the CarbonShield™ toe to the StableStride™ platform that makes it easier to walk over uneven ground. The rubber sole is anti-slip and resistant to oil and abrasions, as well as being able to cope with heat too. This next pair from Timberland are more like a traditional work boot with a steel safety toe that fulfills a variety of ASTM standards, including compression. There’s electrical hazard protection too which also has ASTM certification and with anti-slip plus oil and abrasion-resistant soles, it’s got everything that a worker could ever need. The soles are made from rubber to provide excellent traction and grip on all terrains, including protection from electrical hazards. The Comfort System™ means that despite the rugged nature of the boot, it’s comfortable to wear and won’t fatigue the legs and feet. Padded top collars provide cushioning around the ankle and there’s a soft fabric lining too. Inside the shoe, the polyurethane footbeds are removable and also have an antimicrobial treatment to prevent odor build-up. You’ll be as well cared-for as an Indy 500 race car too with the Goodyear® welt construction. Aesthetics aren’t ignored either as you can pick from black, brown or wheat in this classic-style work boot. Despite not having a steel toe, Timberland have designed these boots to provide excellent protection and to keep the foot safe. The upper is made from full-grain waterproof leather and is paired with a molded composite safety toe. This combines with a polyurethane midsole and TPU outsole for a tough grip that can tackle any terrain. The leather has been specially tanned to repel moisture and water, and on the inside there’s the same waterproof membrane that the other Pro boots have been lined with. These boots are capable of tackling all kinds of climatic conditions and include a low-temperature formula to ensure they remain flexible even in subzero settings. The composite toe is non-metallic and there is a tough heel cup protector. This latter feature isn’t always popular with customers but helps to provide stiffness and protection to the rear of the boot. 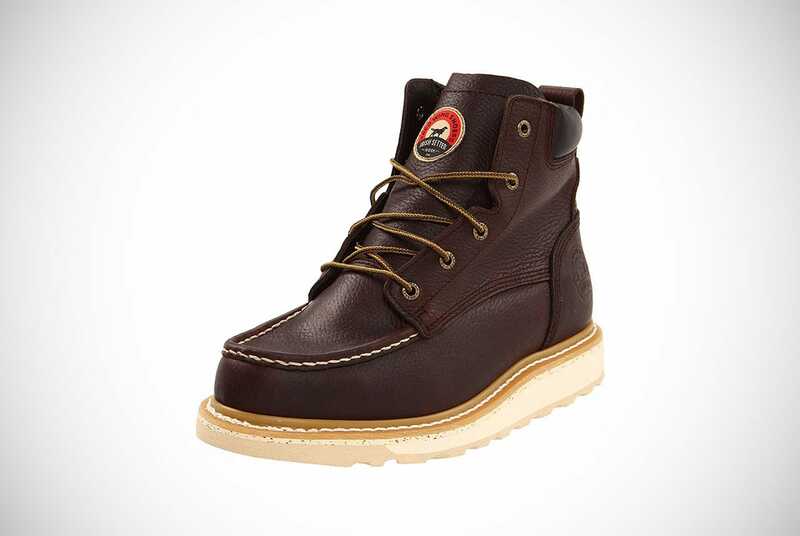 The distinctive Timberland padded collar is included for comfort so the boot will grip the ankle snugly without rubbing. It’s a top-quality work boot which is safe and suitable for use in a wide range of working conditions. However, at more than 2lbs for a single size 9 boot, it’s fairly weighty. Carhartt is one of the best-loved brands which originates from the US. Created more than a century ago, it was first set up in 1889 in Detroit. Their original focus was on making durable workwear for the railroad workers. These initial principles have served them well, providing the perfect grounding for some of the best work boots around. 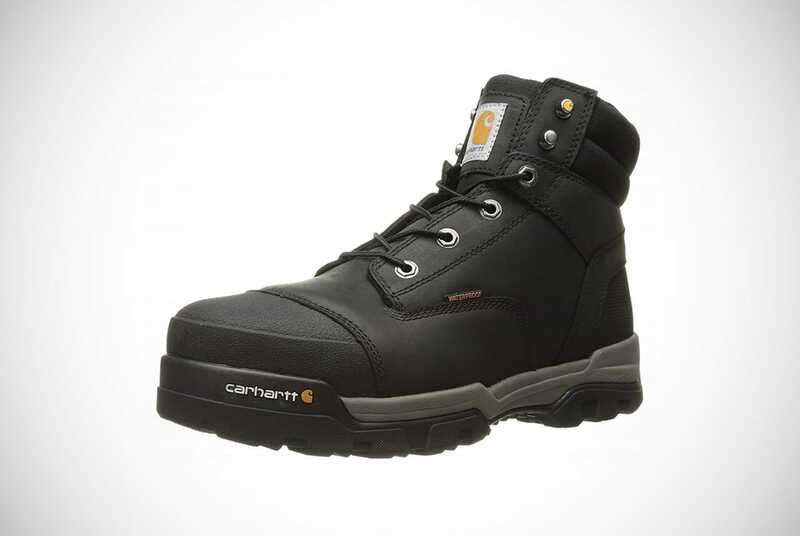 Carhartt have a reputation for professional footwear which lasts well, is safe and also comfortable to stand in for long periods. It’s fair to say that over the decades Carhartt have committed themselves to researching and honing their knowledge, to stay on the cutting edge of workwear. As well as making boots, they also produce a range of clothing which are suitable for extreme conditions and sports. It’s this technology which makes their work boots stand out from the crowd. Carhartt say that they should feel no different to a sneaker, yet providing the safety and protection of a traditional work boot. Not many brands can say the same but Carhartt use breathable materials which are waterproof, wick away sweat and are anti-odor too. If you’ve ever caught a whiff of a pair of work boots after a long day, you’ll appreciate just how useful that last quality is! It’s hard to believe that this boot is suitable for work as it looks like a comfy old moccasin that’s dying to be slipped on. Yet those clever bods over at Carhartt have managed to create a soft toe work boot that’s stylish, easy to wear and doesn’t look like your feet have been encased in concrete! It’s a lightweight boot so won’t be suitable for all types of heavy work but the soft toe is certified to meet ASTM 2892-11. The leather has been oil-tanned for a moisture resistant finish and inside there’s a fast dry® lining which gently wicks away sweat leaving feet feeling dry. The insoles are made from Ortholite™ so there’s cushioning for comfortable, prolonged wear. There’s not really any cushioning around the ankle so these boots can take a little while to wear in. However, the soft finish means the body of the boot molds to your foot far quicker than more rigid designs. A rubber outsole provides great traction and grip and the cement construction offers durability and toughness. 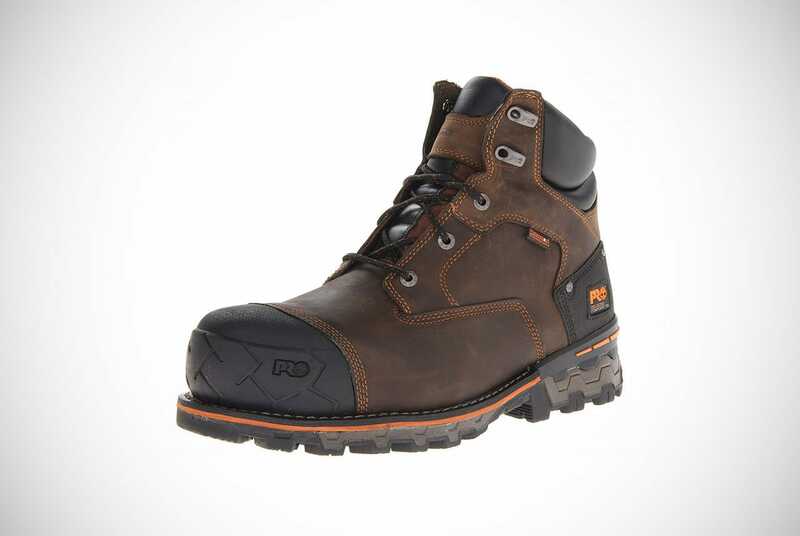 Unlike many of the other boots on our list, this is one design you could comfortably wear for leisure as well as work. 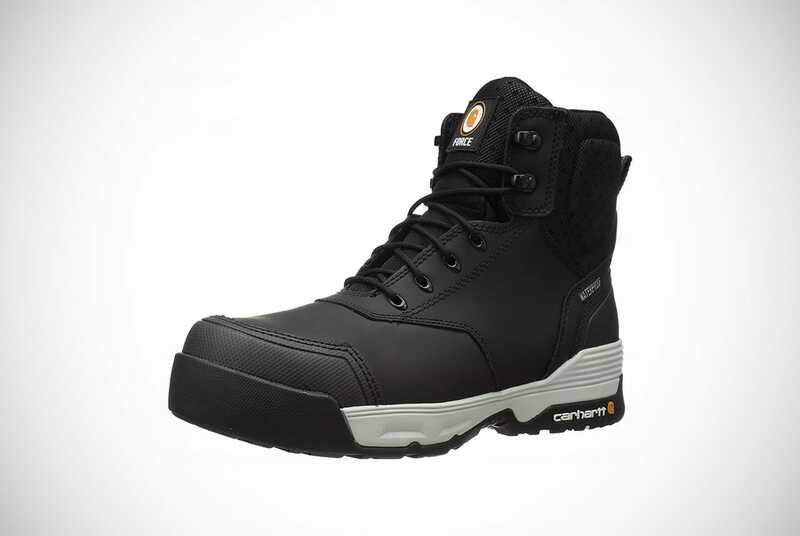 If you’re looking for a lightweight work boot that won’t weigh you down, Carhartt may have the answer with this composite toe model. Their lightest boot to date, it looks and feels just like an overgrown sneaker but still offers a range of excellent protection for the foot. The upper is made from a combination of leather and Araiprene™. Coupled with a cement construction and a rubber sole it’s entirely waterproof and long-lasting. 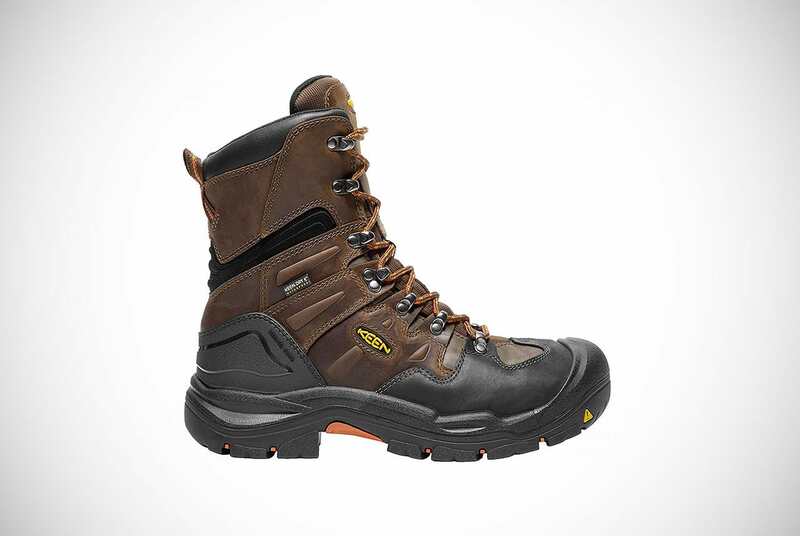 Inside the boot there’s the Carhartt Storm Defender® breathable membrane which also wicks away moisture from the foot. This helps to avoid hot, sweaty feet when you’ve been working on a long day! A composite toe is included for protection and this is certified to ASTM 2413-11. Ortholite™ cushioning helps to prevent fatigue as well as getting rid of any nasty whiffs. However, it’s the sole which is something really special as it offers outstanding flexibility as well as grip and traction. This makes it much easier to work in conditions where you need to have good maneuverability. If you were a fan of Kickers in the 1980s, you’ll love the shape and design of this shoe. There’s something that looks very similar to the retro French brand, but this is a work boot that offers great protection. They look good enough to wear as a leisure boot with your cargo pants or skinny jeans but they’re equally at home in a working environment. The leather upper is completely waterproof and comes with an electrical hazard certification, and that’s just for starters. Rubber outsoles provide excellent grip while simultaneously shedding debris, allowing easy movement on a variety of surfaces. The soft toe meets ASTM 2892-11 for electrical safety standards and contributes to the flexibility of the whole boot. The soft and pliable design allows the foot to bend and flex as needed, offering agility while on the job. The Storm Defender® technology is back for this boot too, providing a breathable membrane that also wicks away the sweat. Comfort is taken care of too with the cushioned inners. A polyurethane strobel pad helps to absorb and return energy with every step you take, reducing fatigue and offering a comfortable durability. If you don’t need a tough steel toe but are looking for grip, protection and flexibility it’s hard to find much better than this. There has been some serious technology invested into this pair of boots with an insole which is quite simply outstanding. Carhartt were determined to go one better than the rest of the market and studied more than 120,000 3D scans of feet using CAD software. This produced an insole which has been engineered specifically for the working day. Arch support minimizes fatigue even when worn for prolonged periods while a double foam layer absorbs shock as well as offering comfortable cushioning. It’s certified to meet ASTM 2413-11 for electrical hazards and in keeping with this, there’s no steel toe. Instead protection is provided via the composite toe which is wide to prevent cramping during a long working day. A suede cover on the insole helps to add almost a third more grip while on the outside, the sole is anti-slip and deeply cleated for traction. Made from rubber the sole is also resistant to oil and chemicals and allows you to walk with confidence on any surface. The boot itself has the distinctive Carhartt look, combined high-quality black leather with the composite surface. The oil-tanned leather has special moisture-repelling qualities which enhances the waterproofing of the boot. On the inside, the Storm Defender® membrane is both waterproof and breathable. Irish Setter is a division of Red Wing (more about them a bit further down!) and comes from, yep you guessed it! Red Wing, Minnesota. 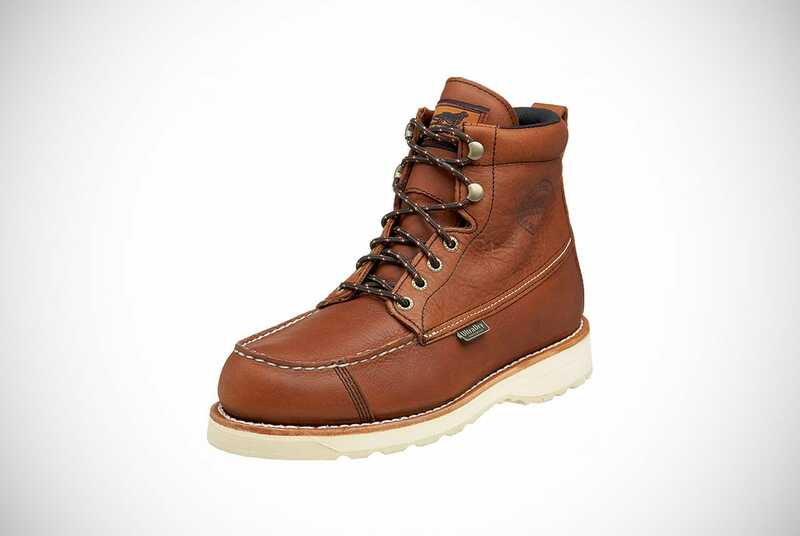 The very first designs were very similar to Red Wing boots but are widely accepted as being the very first pieces of footwear to be exclusively designed for outdoor hobbies. The name of this brand came from the color of the original leather, a deep reddish-brown similar to the dog of the same name. This leather was specially treated to be acid-resistant and durable in a range of outdoor conditions. The stunning outdoor landscape of Minnesota is ideal for a brand such as Irish Setter. A premium item of footwear, it offers performance boots and shoes for fishing, hunting and other outdoor pursuits. This has extended into workwear too, a natural progression given the qualities of both Irish Setter and its parent company, Red Wing. The modern collection from Irish Setter includes a vast range of boots that offer protection against electrical hazards, metatarsal damage, chemical spills and heat. Different designs are also puncture-resistant, waterproof, anti-slip and suitable for wear when working with oil and gas. If you need a work boot, you can be certain that Irish Setter have the kind of protection you need. 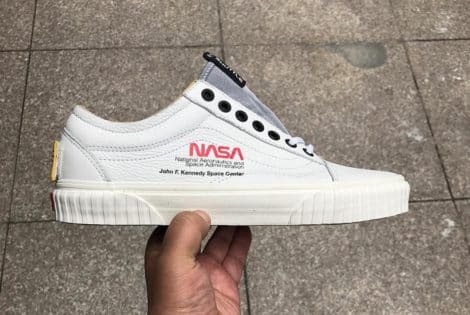 You won’t find these to be the cheapest on the market but with a variety of fits, including footwear suitable for wide feet, it’s well worth every dollar you’ll pay. This may be a work boot but it’s got the appearance of a leisure boot that’s perfect for hiking and hunting. If you’re not planning on using it for work, it will be an excellent bit of footwear for outdoor pursuits that won’t weigh you down too much while you’re on the move. In fact, this is the boot that first launched the Irish Setter brand. Designed as a hunting boot that looks as good as it feels, many generations of hunters have worn this footwear while pounding the fields and forests. Comfort is really what this boot is all about with a steel support shank and a Goodyear welt construction that’s tough and durable. The ankle high design with contrast stitching and moc-toe is partially inspired by the moccasins worn by the North American Algonquin Indians. This creates a well-fitted and spacious boot that won’t cramp or pinch. The leather upper is completely waterproof and the polyurethane lining wicks away sweat and moisture so you won’t end up with damp socks. The molded heel and EVA midsole provide extra cushioning and shock-absorbency, helping to make every step bouncy and soft. The grip isn’t deep but you’ll get enough traction for hiking and trekking across uneven ground with a rubber sole that won’t slip. There aren’t any specific safety features that you might find on more industrial work boots, but the excellent craftsmanship, sturdy composition and high-quality materials should be more than enough. Unlike the first Irish Setter boot, this one is clearly designed for work and provides all the protection you need to get the job done. It’s a tall boot at 8” high but this provides unrivalled support for the ankle on uneven terrain. There’s extra room in the toe area – 44% extra room in fact – due to the King Toe technology that provides the protection. These are a steel-toed boot so you’ll get the maximum possible protection against crush injuries, meeting ASTM F2413-11. They also offer protection against electrical hazards due to the energized components within the sole and the heel. This makes them an excellent choice for a variety of hazardous environments. The polyurethane footbed provides soft cushioning for grip and absorbency during wear. However it’s also removable so orthotics can be fitted inside the boot if required. The uppers are 100% leather and benefit from a Goodyear welt construction. This makes sure the boot won’t pull apart when put under pressure. They’re not waterproof but a quick covering with mink oil will increase the resistance to moisture of any kind. The sole isn’t as deeply cleated as some other boots but it still offers an excellent grip. The added benefit of a more shallow tread it that it won’t collect debris and mud so easily. These boots have the advantage of looking just like a casual pair of hunting boots but in fact they provide excellent protection for working environments. They are a soft toe boot but meet the standards for ASTM F2892-11 for electrical hazards. Although they’re not designed for environments where crush or impact injuries are possible, they’re ideal for working with electrical components to reduce the risk of shock. One of the biggest nuisances about most work boots is that they’re stiff and uncomfortable when they’re new. The majority take some time to wear in, and the process can be less than pleasant. This pair of Irish Setter work boots make a delightful change as you can simply slide into them straight out of the box. They’re so soft and comfortable you won’t need to go through the normal rigors of wearing them in – bonus! Despite the high comfort factor, these boots are surprisingly tough. With a moc toe and triple contrast stitching, they’re a durable design which will last even with prolonged wear. The upper is made from full-grain leather and the polyurethane sole is removable, if required. The rubber sole has a decent grip which can adequately deal with most surfaces but it’s also heat-resistant, able to cope with temperatures up to 475 degrees Fahrenheit. Originally a Californian company, Keen is much younger than the other companies in our hot list. Founded in 2003, it’s since moved base to Oregon – Portland to be precise. As well as making bags, shoes and clothing, they also specialize in workboots. Both designed and manufactured solely in the U.S, there’s a commitment to quality which is evident from the moment you slip a pair on. Comfortable yet protective, there’s no compromise on safety despite the stylish appearance. 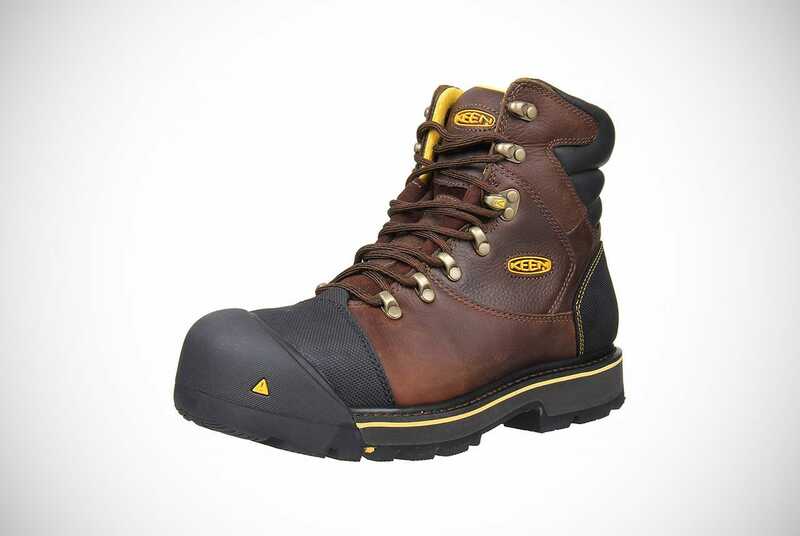 Keen is a great choice for anyone on a tight budget as you won’t find that any of their workboots blow you into bankruptcy. Every pair is hardwearing and durable but doesn’t cost a fortune, a great combination that brings the best of both worlds. You can choose the type of boot you need from the range they have available which specifies the type of protection on offer. Just like Irish Setter, the brand offers lots of different boots for various settings including warehouse, transportation, heavy industry, manufacturing and construction. The Keen Utility Work Boot for men is tough, rugged and strong, and deliver exactly what’s needed. 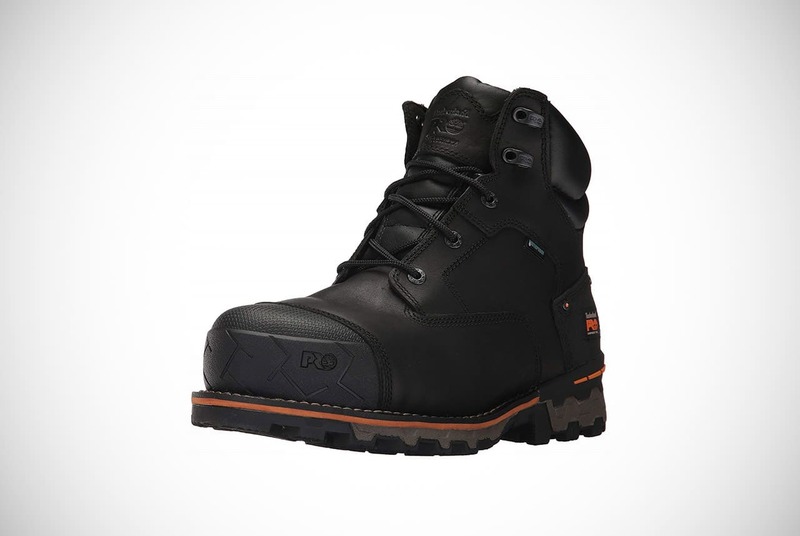 Despite the budget-friendly price tag these boots offer superior protection and are suitable for wear in a range of challenging work environments. The leather upper is abrasion-resistant and provides extreme toughness as well as flexibility while on the move. It ticks every box for men’s work footwear and it won’t break the bank either. Despite having a tough steel toe, the toe box is roomy and won’t nip at your feet. This reduces the chances of cramping and numbness, and won’t cause blisters during prolonged wear. The design is clever with the KEEN Patented Toe Protection; this involves the outsole wrapping up and over the toe cap. This provides optimum levels of protection and makes the whole boot even more durable. The upper isn’t completely waterproof but it is water-resistant and using a protective spray can enhance this further. A Goodyear welt construction helps to keep as much moisture out as possible while adding extra stability to the boot. 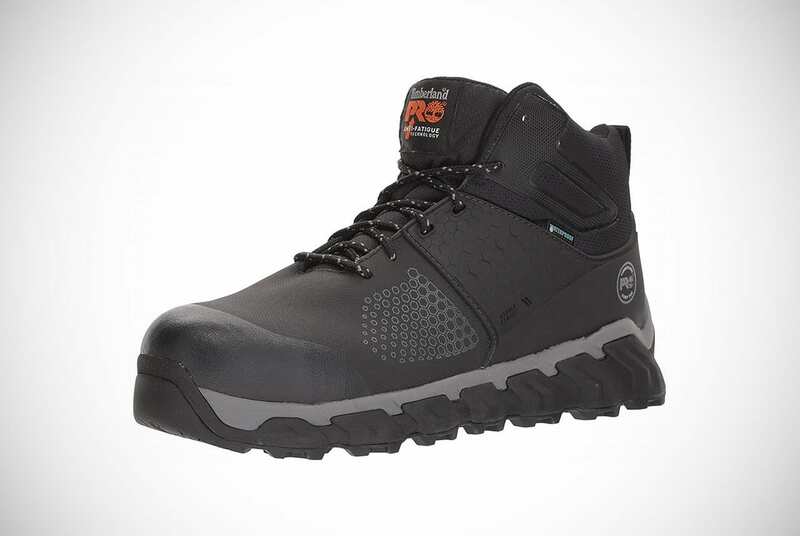 It meets a variety of ASTM standards and with an anti-slip, oil-resistant sole you’ve got all the grip you could ever need to be confident across all terrains. It’s hard to believe these boots were designed for work as they’re stylish enough to slip on with a pair of pants or jeans. A short 6” design coupled with a simple upper with contrasting stitching helps to create a boot that looks as good as it feels. We know you might have heard that before – but with this one, it’s really true! The Utility Seattle boot from Keen allows you to move between work and leisure seamlessly without having to change your footwear. It’s surprisingly tough and durable despite its innocent-looking exterior, and provides excellent protection. Although it doesn’t have a steel toe, it’s got aluminum protection in the toe cap instead. This provides a lighter weight boot while still offering a safeguard against crush and impact injuries. However; it’s the non-slip design which really stands out, meeting ASTM standards for certification. The TPU shank provides extra support in the midsole while the membrane inside helps your feet to stay dry and sweat-free. If you’re the kind to suffer from stinky shoes, the Cleansport NXT™ might be just what you need to stay odor-free. All of this comes with a leather upper, moisture-wicking fabric lining and removable footbed. Impressive stuff! For the times when you need some serious protection for your feet, there’s this pair of Keen utility boots. At 8” tall, they’re a high boot which supports the ankle as well as protecting the toe and heel well too. Unlike some of the other work boots on our list they wouldn’t ever really pass as a leisure boot, but when it comes to professional use, they are few better than this pair. Built in America, the Coburg boot is made with minimal wastage of materials so if you’ve got one eye on the environment you can purchase these with a clear conscience. The upper is made from 100% leather which provides a waterproof surface that naturally repels moisture. The toe is anatomically correct for the comfiest fit, and provides protection via its steel toe. This also meets ASTM standards for safe wear in hazardous environments. On the heel there’s an additional guard to protect against any accidental scrapes or bumps. The outsole is both oil-resistant and anti-slip, meeting ASTM standards here also, and they provide outstanding grip. On the inside there’s a moisture-wicking membrane to leave your feet feeling warm but dry. 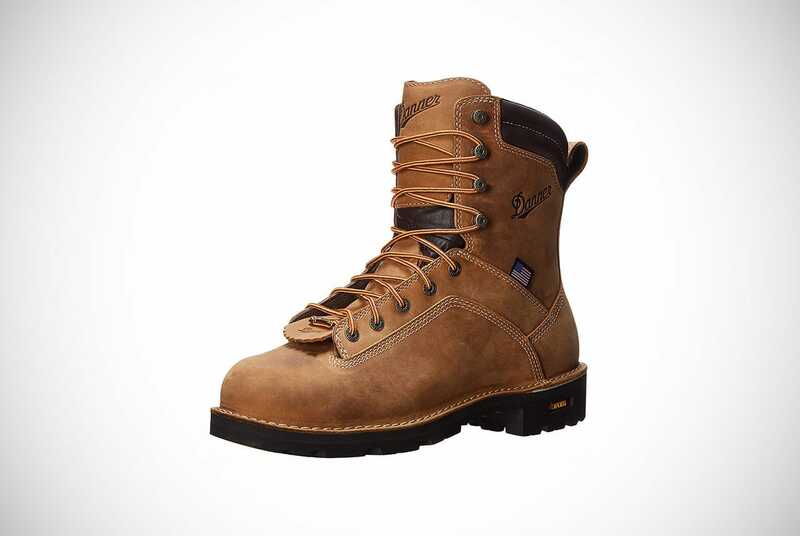 Despite the very modern-sounding name, Justin is one of the oldest brands of workboots in the U.S. A wholly-American brand, it was founded in 1879 and named after its creator, H.J Justin. Owned by Berkshire Hathaway, the brand changed its name from Justin Brands to Justin Original and moved its operation to Texas. One of the biggest plus points about Justin boots is the great variety on offer. You can choose the style you like and match up your safety needs to end up with a boot that looks as good as it feels. Justin offer extremely comfortable boots and they’re another brand which are kind to the bank balance. With a choice of both lace-ups and pull-on boots, you can take your pick of the design you like, all for the same low price. For boots that straddle the line between work and leisure, this pair from Justin Original really tick the box. An attractive distressed brown color, these look just like a pair of regular boots. However, beneath the surface is an extremely tough and durable design that’s ideal for work. The upper is made from 100% leather and handcrafted to a finish in the U.S. However, it’s not just flawlessly finished, it’s also packed full of clever technology to make it feel great all day long. The J-Max® Double Comfort System® includes a mesh spacer cover for the foot bed that creates a much healthier environment, plus ensures comfort. The insoles are removable and can be replaced with orthotics if necessary. The Justin Jel® is a deeply-cushioned foam that helps to absorb the shock as you walk and then returns energy to prevent fatigue. In the heel area and ball of the foot there are strategically-placed gel pads to provide support where it’s needed. The Dri-Lex® helps to wick away any moisture and helps to leave the foot feeling dry. The sole is anti-slip and meets ASTM F2892-11 for electrical hazards. It’s all clever stuff! If you like the look of the boots above but don’t need the steel toe, take a look at these bad boys. Almost identical to the first pair of Justin Original boots we featured, this has all of the same benefits but without the inclusion of a steel toe. That means that this pair feel much lighter and you’ll be more agile, but you’ll still be able to enjoy the benefits of the J-Max® Double Comfort System®. Your feet will stay as dry as ever thanks to the wicking qualities of Dri-Lex®, but these boots have the added advantage of being waterproof too. These also meet ASTM F2892-11 for electrical hazards so it’s really a tight call on which pair to pick! If you like both of the styles above and can’t decide between them, this boot offers an interesting interim option. The safety toe isn’t as tough as a steel toe but provides more protection than a standard soft toe boot. This can be ideal if you don’t want the heaviness of a steel-toed boot but still need some protection. The style is slightly different than the first two, but once again it’s a tall boot with eight pairs of eyelets. The upper is made from 100% leather which is softly padded around the collar. On the inside you’ll discover the same cushioning with the J-Max® Double Comfort System®. The technology behind the design means there’s practically no compression with all the energy being returned instead, adding bounce and reducing fatigue. The gel pads in the ball of the foot and heel also aid with conserving energy and mean you can wear the boots for many hours without feeling heavy-legged. As mentioned above, Red Wing have an affiliation with Irish Setter, so it’s not a surprise that the two brands have many similar qualities. Red Wing Shoes became successful very quickly and within a decade of setting up, was produced more than 200,000 pairs of boots every year! They played a major role in equipping soldiers during World War I and went on to produce military boots again for American soldiers who fought in World War II. 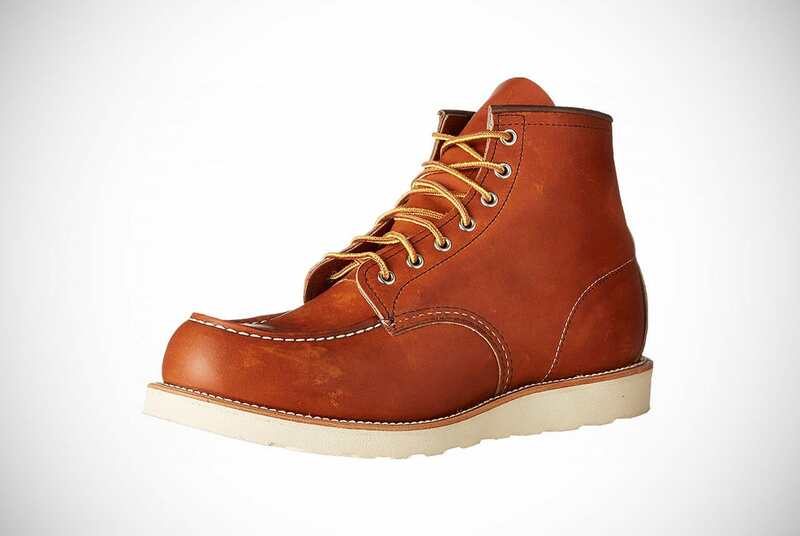 Red Wing have flirted with offering fashion shoes but it’s really their workboots for which they’re known. As well as military-grade boots, they’ve also got boots suitable for miners and other specialist industries, such as those which include electrical hazards. As well as producing their own boots, Red Wing also manufacture footwear which is labelled under other brands. 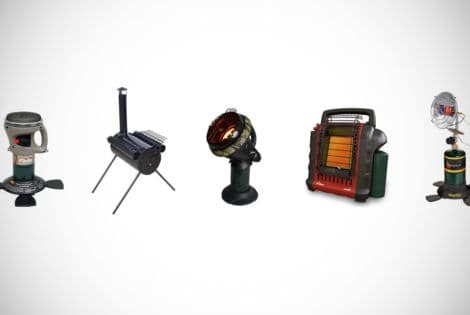 These include Irish Setter (as mentioned above), Worx and Vasque. 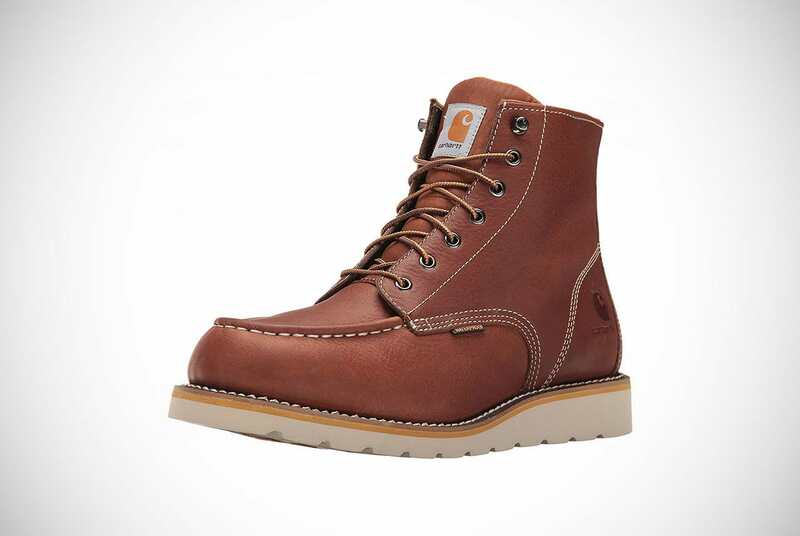 They previously produced boots for Carhartt but this arrangement stopped in 2011. If you’re looking for a pair of work boots that aren’t too industrial-looking, this classic pair of Red Wings could be just what you need. Far more slimline and less clunky-looking than many other work boots, these would look just as good worn casually for leisure. It’s worth mentioning that although there are many redeeming features on these boots, they don’t offer the same safety protection as many others. There’s no safety toe nor any ASTM certification so if these are priorities then you’d need to look elsewhere. However if you’re simply searching for a boot that is tough, robust and comfortable to wear, this Red Wing design ticks every box. The leather is thick, more than 2mm, so when they’re brand new they can feel stiff. If you persist with breaking them in, you’ll find the boot molds to the shape of your foot, giving you the most comfortable fit of your life! There’s a long history behind the design of these boots, with Red Wing originally setting out to make a boot for the miners. This meant creating a boot with an oil-resistant sole that could be worn for long hours. Today’s boot still retains many of the first features including the “capped” toe. This isn’t steel or composite, but a double layer of leather that creates the distinctive bulging appearance. The smooth cork sole has been replaced by a mini lug, giving excellent grip in all terrains. 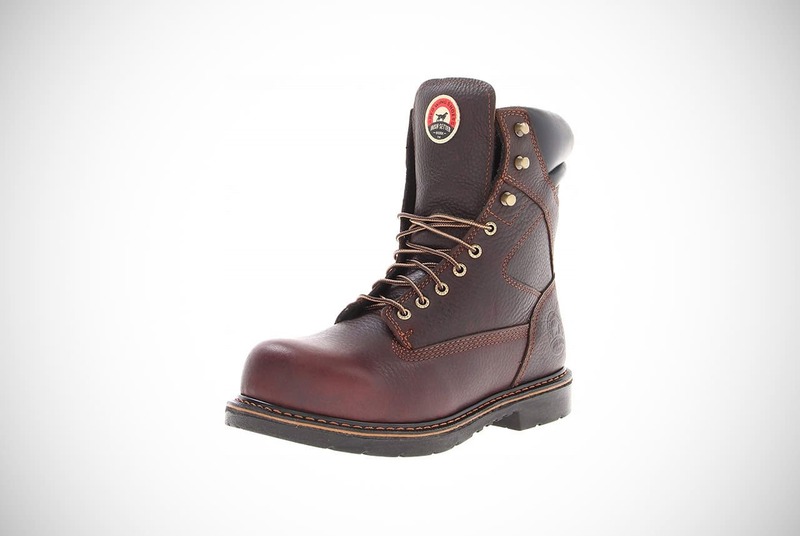 This is another of Red Wing’s classic styles which combine hardwearing function with beautiful aesthetics. Just like the Irish Setter style above, the stitching on this boot was inspired by the footwear of the North American Algonquin Indians. This style was originally designed for sportsmen in the 1950s but was so comfortable it was quickly adopted by factory and farm workers who needed performance footwear that they could wear all day. 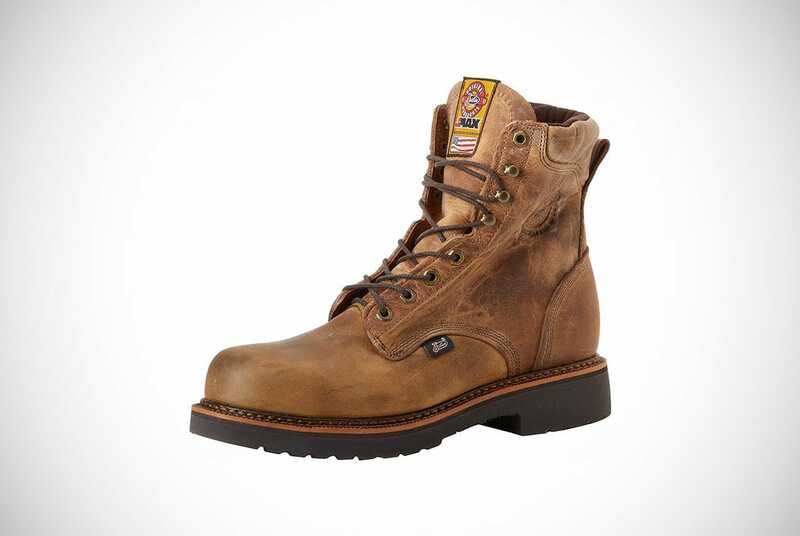 Like the other Red Wing boot on our list, you won’t find a great number of safety features incorporated in the design. Instead, there’s just top-quality craftsmanship and a design which is comfy and very wearable. Oil-tanned leather is used for the upper which gives a far more natural appearance. This means the boots are not completely waterproof but they are water-resistant. As well as being resistant to rain and water on the exterior, it means they’re also sweat-resistant and don’t stain easily. 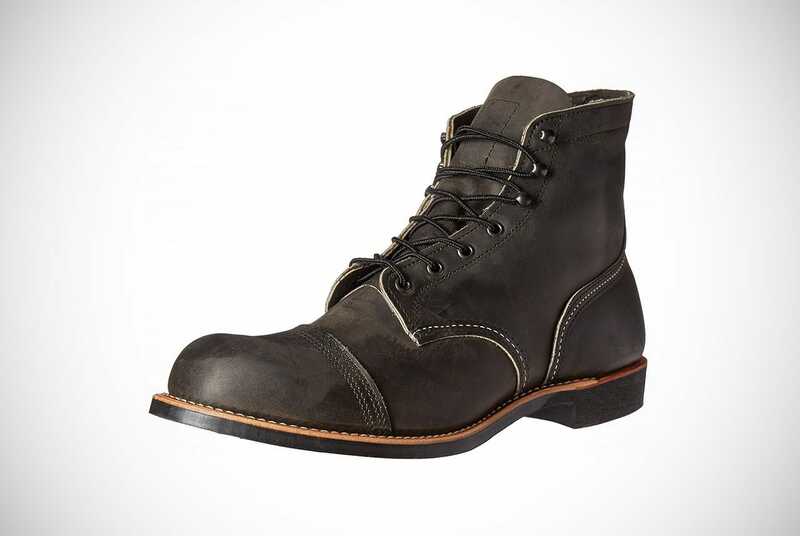 Red Wing boots deliberately come up large so it’s generally recommended that you move down at least by half a size when purchasing. This means when they’re new they should feel a little on the tight side but should still have plenty of room to wiggle your toes around. There’s not as much grip with these boots as with some of the other work boots we’ve mentioned. However, the wedge style heel and rubber traction sole should be sufficient for most surfaces. Based in Oregon, Danner is a brand which has always represented high quality, making the focus on the craftsmanship rather than producing volume. They’ve been around since 1932, steadily producing a stream of designs which cater to their customers’ precise needs. The company was bought by fellow footwear specialist LaCrosse in 1994. LaCrosse started up in 1987 and had acquired its own reputation for high quality. Since the two footwear manufacturers combined, the business has gone from strength to strength and has become known for its work boots. Suitable for hunting, agriculture and construction, these boots are the business. There are lots of reasons why Danner really hits the sweet spot with customers. They’re well-priced and won’t break your bank account, even though each boot is carefully crafted to exquisite standards. They’re durable, comfy to wear and even though they’re practical, they look great on too. Bnus! 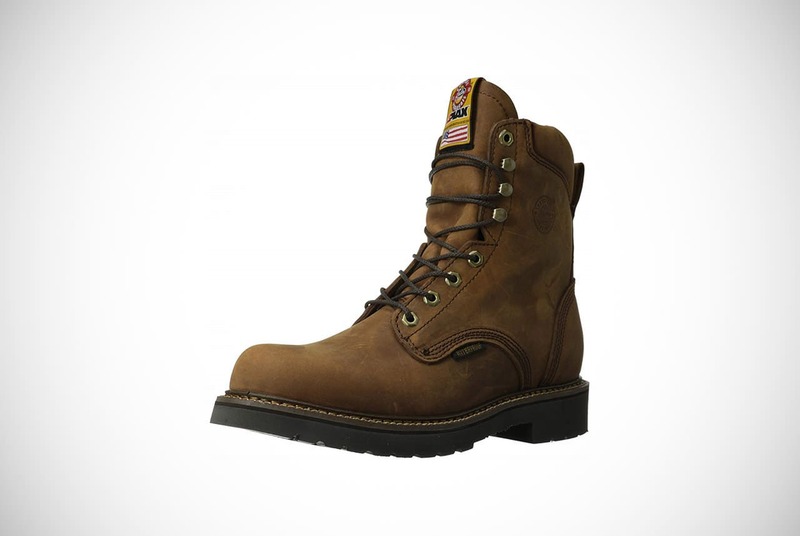 This pair of work boots are taller than many of the others on our list with 9 pairs of eyelets. This together with a stylish distressed brown finish means that these work boots look great worn casually too, topped by a pair of combats or slouchy jeans. 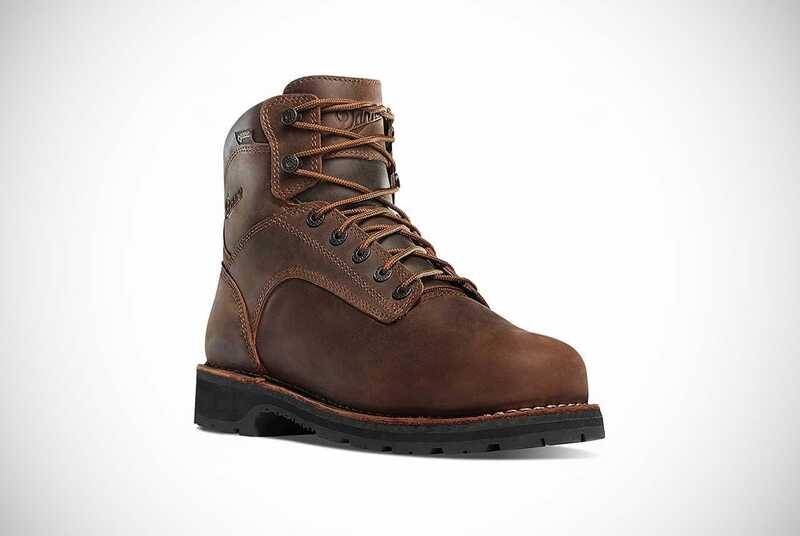 There’s a number of reasons why this is one of Danner’s most popular boots, and these include the striking good looks of the 100% leather upper. The soft collar ensures that the boot doesn’t rub the ankle while triple-stitching offers durability. In the mid foot there’s a fiberglass shank which delivers an energizing boost. The composite toe provides ASTM-certified protection against electrical hazards as well as helping to safeguard against crush injuries. The sole is made from rubber and features an enhanced grip which provides traction even on difficult surfaces. The boots are anti-slip and are also resistant to oil, allowing them to be worn in a variety of settings. Inside, the insole is deeply cushioned and a Gore-Tex membrane keeps every drop of moisture out. If you look carefully at the laces you’ll spot a small metal tag bearing the Gore-Tex name. It’s these small little details which set Danner apart and reveal the meticulous attention to details provided by the master craftsmen. The second of our Danner boots is slightly shorter than the first entry, although it’s still a fairly hefty six eyelet design. This means it sits higher than the ankle, providing support and strength, and making it suitable for uneven or difficult terrain. The upper is made from full-grain oiled leather which gives them an authentic distressed appearance. This avoids the dreaded “new boot” look; the first time you slip these on they’ll look as if they’re a pair of old friends! Aside from the aesthetics, the distressing also serves a practical purpose as it helps to improve the waterproofing qualities of the boot. This is further helped by the Gore-Tex lining which is not just waterproof but fully breathable too. All of this means that your feet will be well-protected and dry without feeling hot and sweaty. Inside, there are Ortholite™ insoles which provide deep cushioning and comfort during extended wear. The dual design in the sole includes a rigid heel for optimum protection coupled with an alloy toe and flexibility in the front of the foot. This means this boot is a top choice for the times when you need to be able to move with precision and accuracy. The composite toe meets the criteria for ASTM F2892-11 EH and ASTM F2413-11 so you can enjoy real peace of mind over the protection on offer. 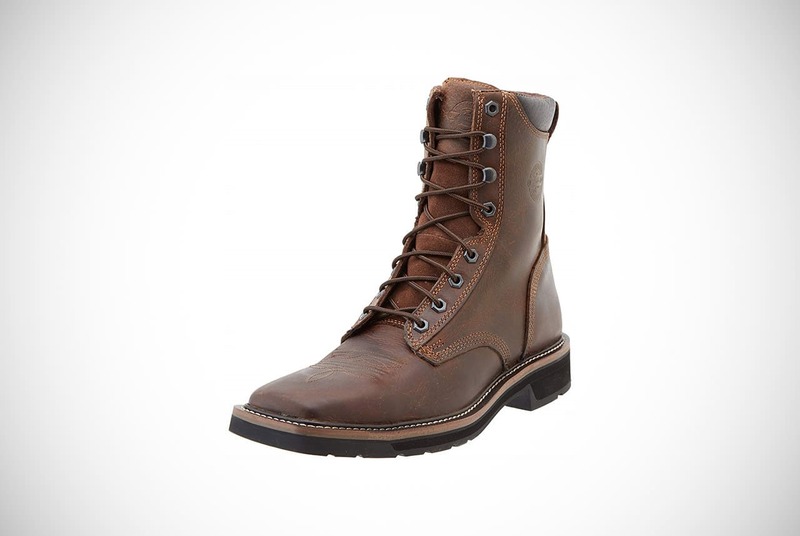 This is another pair of tall boot from Danner, reaching 8” up from the shaft and incorporating 8 pairs of eyelets. Made from 100% brown leather, they look stylish and smart despite their heavy duty performance. The padding around the collar helps to cushion the boot against the leg and the leather is thick, but soft. This means the boots don’t take a long time to wear in compared to other styles. There’s a non-metallic safety toe built into this boot which meets the ASTM standard for electrical hazard protection. This means that the boot tends to come up a little narrower than usual; some customers recommend sizing up. The heel is 90 degrees which may feel a little awkward at first, but it will help you to stay on your feet on uneven surfaces. An anti-slip and oil-resistant sole completes the package, ensuring that you’ll get good traction wherever you go. 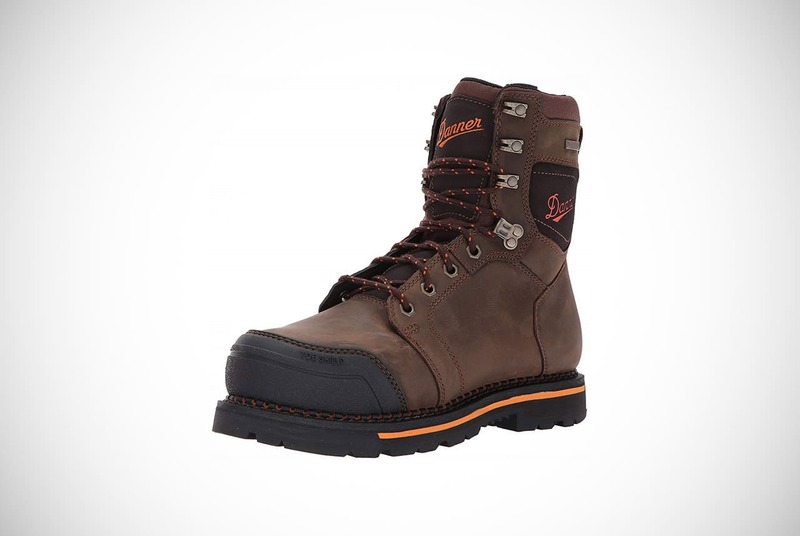 The technology known as Danner Dry does a top-rate job of waterproofing the boots. Even in the heaviest downpours, your feet will stay warm and snug. The membrane allows moisture to escape from the foot, helping to eliminate sweat. However, it’s worth pointing out that these boots will keep your feet very warm so probably aren’t a great choice for working in higher temperatures. Ortholite™ insoles and shock-absorbing soles mean that even if your feet do get warm, they’ll feel extremely comfortable. Even though they’re a heavy 2.5lbs per boot, you won’t feel fatigued after a day of wearing these, which is seriously impressive! So, Which Boots Are Made For Walking? We’re finished! We’ve now walked you through all 23 of the best work boots for men and there’s plenty to think about! The differences in working environment mean it’s not possible to pick an outright winner because much depends on how and where the boot will be worn. Not all environments are as hazardous as others, and not all require the same level of protection. What we can say for certainty is that all of the above work boot manufacturers offer outstanding quality. With a range of prices to suit your budget, we’ve got no doubt that you’ll be able to find an excellent boot that will last. 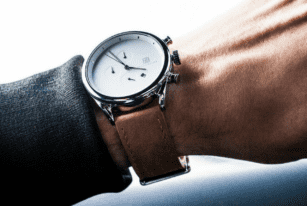 Women seem to have endless accessories for date nights and whatnot while us guys are left to a few select pieces, which makes it even more important that we find a standout and classy watch. 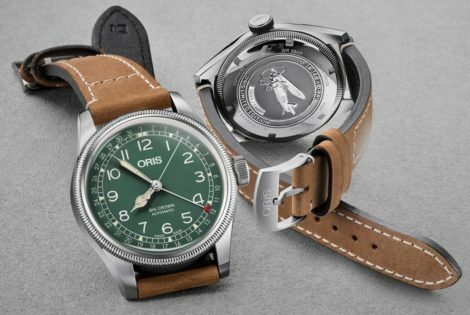 The crew over at Ballardier have you covered with a range of quality watches. Leave wiping your brow to working out and find the best home gym equipment without breaking a sweat on our buyer guide. 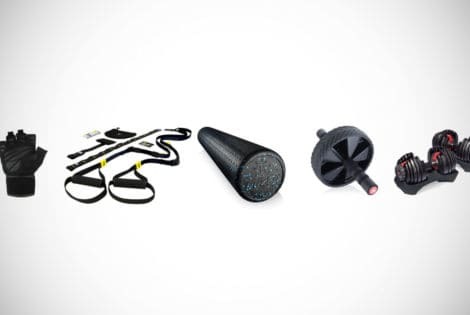 Take a look at new home gym essentials right here.